TOM MILLER knew he was an artist from the time he could first hold a pencil. Carrying forward his artistic momentum from previous lifetimes, his range in this life spans a wide variety of creative endeavors including painting, videography, musical compositions, photography and an occasional bit of poetry. As a young man, his dedication to fullfiling the will of God for himself drew him to the messengers, Mark and Elizabeth Prophet, founders of The Summit Lighthouse movement and set the sail for the remainder of his life's journey. 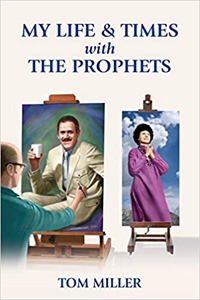 In this tome, you will read stories highlighting his experiences attempting to draw down the highest art forms and music under the sponsor ship of the ascended masters as well as lessons learned from day-to-day staff life as a disciple of his gurus, Mark and "Mother." Tom's combination of wit, humor, and occasional profundity, as he reflects on those 18 years, will afford the reader a first-hand glimpse into life in a modern day mystery school. The themes of his heart and soul: beauty, spirituality, the masters, ancient archaeology, and alternative energy continue to interest him today and keep him a mentally spry octogenarian.